A lock of Lord Horatio Nelson's hair has been auctioned for £2,500 in Lincolnshire. The hair, which is encased in a brooch, is thought to have been cut from Lord Nelson's head after his death at the Battle of Trafalgar in 1805. It was sold to a private buyer at the auction held at Brown & Co in Brigg on Saturday. The lock previously belonged to a woman from Worksop in Nottinghamshire whose family had links to the famous admiral. The back of the brooch is inscribed with the words 'Horatio Nelson obit 21st October 1805'. Craig Bewick of auctioneers Brown & Co said: "Nelson's hair was cut off the day after his death, before preservation of the body in a barrel of brandy for transportation home to England, a state funeral and burial in St Paul's Cathedral. "To modern tastes it may seem a rather strange - not to say macabre - thing to do, but in the 18th and 19th centuries it was fashionable for people to keep a lock of a loved one's hair, in much the same way that we might carry a photograph around today." 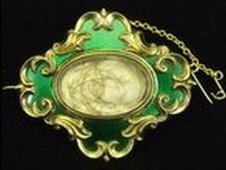 Mr Bewick said he was "staggered" when the brooch was produced by the lady in Nottinghamshire during a routine valuation. "It is a terrific thing, very rare and very unusual," he said. The brooch had a pre-sale estimate of £300-£500.